Ever since director Tim Burton became acquainted with CGI, I have found his fantasy films (e.g., Charlie and the Chocolate Factory (2005), Alice In Wonderland (2010)) to be lacking that unmistakably dark and crazy visual quality that was so prevalent in Beetlejuice (1988), Edward Scissorhands (1990), and Batman Returns (1992). And although Burton only produced (but did not direct) the stop-motion animation classic, The Nightmare Before Christmas (1993), his fingerprints were certainly present and the results were astonishing. So I was excited when I heard about Burton’s new film – Frankenweenie – which not only finds him venturing back into the realm of stop-motion animation for a second time (as part of a two-film deal with Disney that included Corpse Bride (2005)), but has him returning to his own very personal 1984 live action short film of the same title. Frankenweenie is a very loose retelling of the Mary Shelley classic with Victor Frankenstein being a junior high loner with a propensity for filmmaking and science. When Victor’s high-strung dog Sparky is killed by a car, Victor takes inspiration from his science teacher and resurrects his best friend in that way we all know so well. But to this familiar storyline, Burton adds a real personal touch (evident from the very first sequence), as well as some contemporary elements to Shelley’s themes (e.g., the myopic results-oriented view and the red state hysteria that surrounds the teaching of science in the schools). Like any good Pixar-era animated feature, there is plenty for both the children and the adults to appreciate. For the cinephile, the movie is chock full of visual and narrative references to horror films covering the last century – not just Frank Whale’s Frankenstein (1931) and Bride of Frankenstein (1935), but Gremlins (1984) and Jurassic Park (1993). As much as I subjectively enjoyed this film, I must also acknowledge that Burton is playing upon the nostalgia of those of us who long for the Burton of old. For Frankenweenie, Burton drops his cast of usual suspects and brings back the voices of Catherine O’Hara (The Nightmare Before Christmas) to fill multiple roles, Martin Landau (Oscar-winner for Ed Wood (1994)) to channel Vincent Price as the science teacher, and Winona Ryder (Beetlejuice, Edward Scissorhands) to play the goth girl next door. All that said, Frankenweenie represents Burton back at the top of his game, having made some changes to the approaches in The Nightmare Before Christmas and Corpse Bride that are especially suited to this material. The black and white cinematography not only serves as an obvious visual homage but really seems to enhance the textures of the “puppets.” Burton also chooses not to set the animation in an artificial fantasyland, but in a semi-naturalistic suburban setting. The houses seem real. The props seem real. In fact, the only part of the environment that has an unreal (or surreal) quality are the people and the animals. Burton has also jettisoned the musical tropes and narrative meandering of The Nightmare Before Christmas and Corpse Bride. Unfortunately, like all too many contemporary mainstream films, Frankenweenie also suffers from Third Act Syndrome. Although there is a really well-conceived sequence where Victor uses his knowledge of science to vanquish a collection of nasties, this plot device seems to gets dropped out of a necessity precipitated by sheer monster inflation. 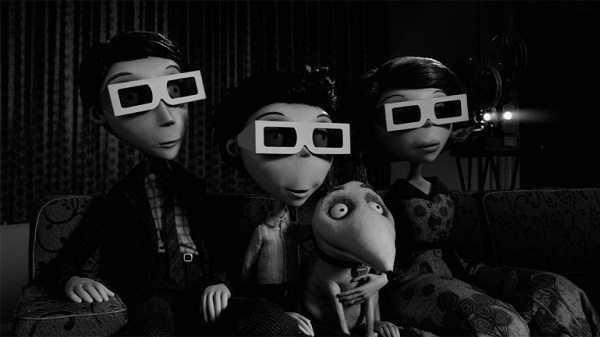 While short of perfection, Frankenweenie is wonderfully rendered and a refreshing change from the CGI-dominated genre. This film seems like perfect timing for me, especially because I’m teaching Frankenstein in my Brit lit class this quarter; all the variations on and iterations of Shelley’s novel are fascinating. (I’m not sure one of Shelley’s themes is “red state hysteria that surrounds the teaching of science in the schools” ?? Maybe studying it again with my students will lead us to that subject though . . .) But variations and iterations of the source material aside, this looks like a film to check out, and I’d like to see Burton redeem himself a little! Burton certainly has two scenes that reflect the contemporary issues involving public schools and the general “ignorant” distrust of science. It’s a bit of an ironic twist on Shelley (insofar as Frankenstein can be viewed as a cautionary tale about the use of science). But no film adaptation will ever surpass the very first film my parents ever took me to – Young Frankenstein, which is probably not good fodder for a literature class. Yes, Shelley’s attitude towards science itself is rather ambiguous; she’s more interested, I think, in what fallible human beings do with science (or any new piece of knowledge) and, particularly, with the power it gives them. I’ll look forward to seeing what Burton does with the story. I WISH I could use Young Frankenstein in my class; it’s the best!